Finally. One of the great mysteries of nature has been definitively answered-- does an octopus have 8 arms or 8 legs? The answer: neither. A whole battery of scientists has determined that an octopus has two legs and six arms. Scientists from 20 science centers collected data from 2,000 observations of common octopuses to gain this astounding insight. Scientists found that an octopus generally uses its back two tentacles to push itself. There is no anatomical difference between the limbs. The difference is found in the way the appendages are used. Claire Little, from the Weymouth Sea Life Centre, said, "We've found that octopuses effectively have six arms and two legs." Wow. Now I can push the button on Jeopardy when that fact arises. 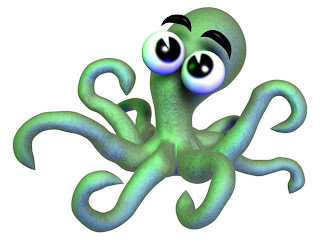 Does an octopus really have two legs and 6 arms or could it simply be that the two long-thingys in the rear are simply in the most suitable place for pushing? (Using their logic, I might say that my Scotty dog has two arms and two legs, since she pushes herself off with the rear legs more than the front legs). But heck. Who am I to question? I sure am glad that scientists are hard at work investing time, money and energy to make these cutting-edge contributions to science. Yeah, why would there even be a distinction? That's weird.